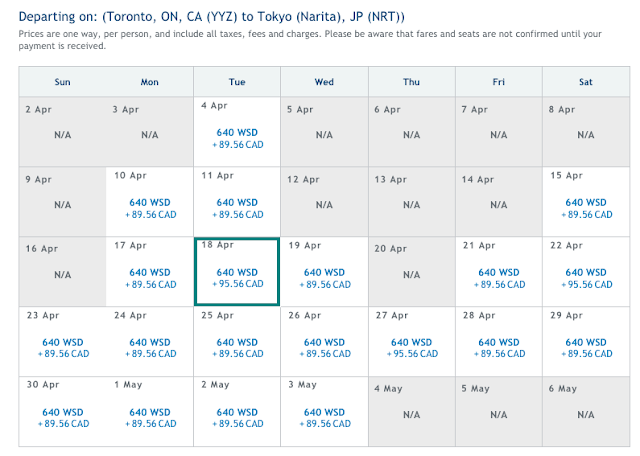 Unlike redemptions on WestJet where one WestJet dollar equals one Canadian dollar towards airfare, the WestJet Rewards redemptions for travel on Delta are a flat rate award chart style. To start the redemption portion of the partnership there are only a few select Delta routes where you will be able to redeem WestJet dollars for and you will only be able to redeem for economy class at this time. The above rates are valid from any Canadian city that WestJet serves which can make this very valuable in those cities where fares tend to be high, for example redeeming 1,500 WestJet dollars between Vancouver and Sydney may not be the most ideal but redeeming that amount from Gander or Halifax can prove to be a great deal. We spoke with WestJet a few weeks ago about the new options and the rates appear to be tied into the credit card earn rate with WestJet while using Aeroplan as their primary comparison focus rather than many of the travel anywhere credit cards that are available. They also advised us that the redemption rates showing on their website are subject to change when this redemption option is officially announced and rolled out completely. As you can see the WestJet card comes out ahead for their flights on Delta to Europe but for Japan or China and Australia you come out behind in spend requirements. Remember though this is just a baseline comparison for credit card spend and does not take into account other earning from flights and partners or even other potential credit cards. You also have to take into account fees and surcharges that will be tacked onto these flights so for a proper comparison you should look at United flights with Aeroplan since those will route via the U.S. like WestJet's flights with Delta and both airlines will have comparable taxes and fees. Let us know what you think about this latest addition to the WestJet Rewards program! Will you make use of it? Does it make you want to consider the program more so now then ever? Simply comment below!